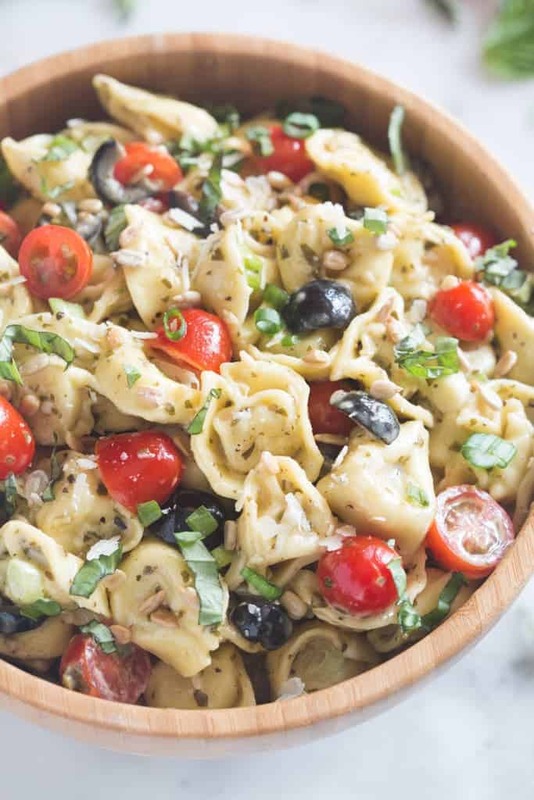 Creamy Pesto Tortellini Pasta Salad is completely delicious and comes together in just a few minutes. 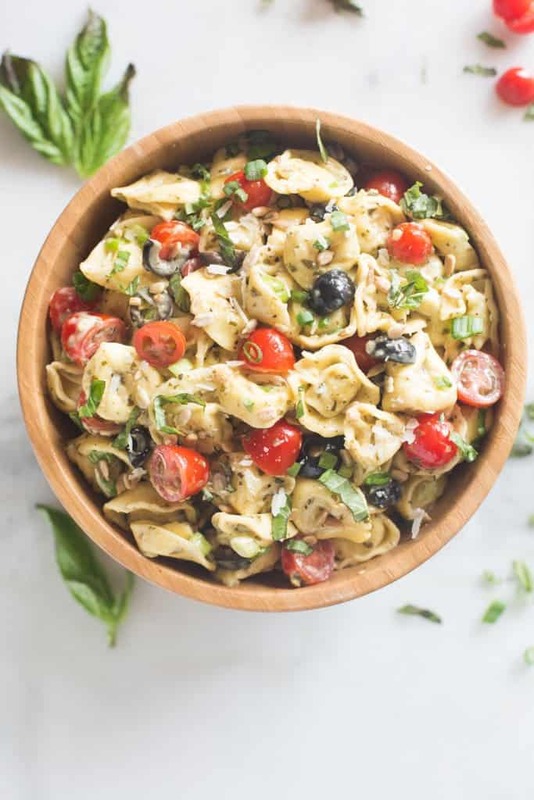 The creamy caesar pesto dressing shines paired with tender tortellini pasta. This is a family-favorite, served as a side dish or a main course. When the warm weather comes around I turn into a pasta salad junkie. 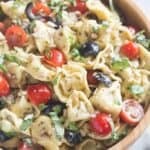 I’ve shared tons of pasta salad recipes, (this Spinach Avocado Pasta Salad and this Teriyaki Bowtie Pasta Salad being two top favorites!) and lately I’ve been really into tortellini pasta salads! I feel like the addition of tortellini makes it that much more “filling” and perfect for an easy dinner. This would also work great as a side dish at a BBQ or summer potluck. If a dish calls for “pesto”, my ears immediately perk up. It’s one of my favorite flavors of all time! You can buy a good quality store-bought basil pesto for this recipe, or you can make it from scratch. (Tip: Use your leftover pesto to make one of these recipes!) The pesto will be mixed with a creamy caesar dressing, which creates the tastiest flavor combo! I use the Newman’s Own brand of creamy caesar dressing, but any good quality brand will work. But, I’d shy away from the store brand of generic dressing–they’re never as good. As with most recipes, high quality ingredients make all the difference! I hope you enjoy the fresh, delicious flavors of this dish as much as I do! Cook the tortellini according to package instructions. Drain and rinse with cold water. 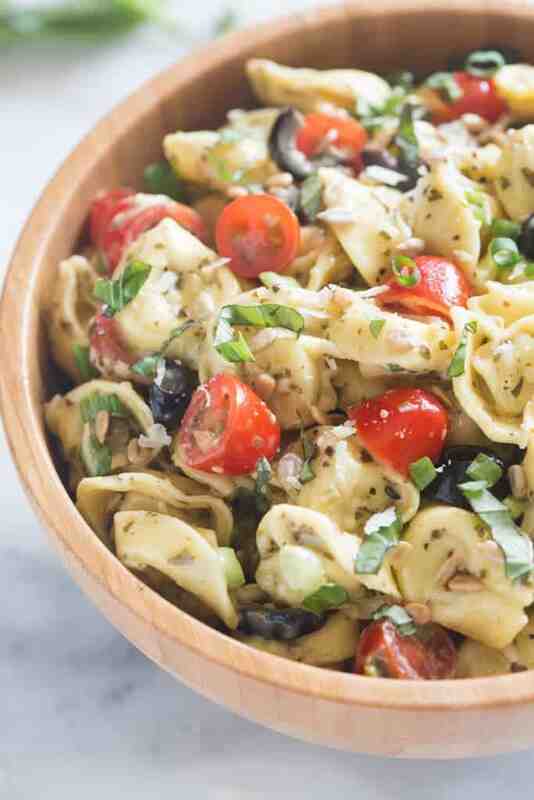 Add tortellini to a large bowl. Add caesar dressing to the pasta and toss to coat. Add tomatoes, olives, green onion, basil pesto, salt and pepper and garlic powder and toss to combine. Add sunflower seeds and 1/3 cup fresh parmesan cheese and toss to combine. Serve warm or cold. Store in the fridge. If it seems to dry after sitting in the fridge (the pasta can absorb a lot of moisture) you can add another spoonful of caesar dressing and/or pesto. Garnish with the remaining parmesan and fresh chopped basil before serving. Holy cow! This was delicious! My family gobbled this up. Thanks for sharing! I love to hear it! Thanks for sharing Amanda! So happy to hear it! Thanks so much Amy! This was delicious. I added some grilled chicken to make it a little heartier as a main dish. It was a hit! This is SO good! I subbed artichoke hearts for the olives cuz my husband hates olives. I love pesto and mixing it with the dressing made it so creamy and delicious. Definitely will be making this for more parties! I made this for a church bbq today. Delicious! There were no leftovers and it was happily gobbled up. Thanks for the wonderful recipe!